Heeding President Trump's request that it adopt a tax reform bill before Thanksgiving, the Republican-led House of Representatives passed a reform package last week. In spite of a torrent of liberal attacks, independent analyses have confirmed that the plan would boost economic growth, create nearly one million new full-time jobs, and reduce the tax burden on the vast majority of Americans; on average, taxpayers in every income group would receive a tax cut. There will be a small percentage of Americans -- many of them wealthier people who itemize deductions and exploit loopholes -- who would be worse off under the proposal. Republicans would be foolish to pretend that every single household and business would emerge as 'winners' if reform is implemented; that would echo one of the biggest lies Democrats peddled about Obamacare. But the data has found that an overwhelming majority of Americans, including (or even especially) the middle and working class, would benefit from the House-approved bill. The Senate, meanwhile, is in the process of moving its own bill. The Finance Committee advanced legislation last week on a party line vote (it's worth noting that zero House Democrats voted in favor of middle class tax cuts), and Mitch McConnell's goal is to shepherd a successful floor vote through in the coming weeks. As we learned during the 'repeal and replace' flop, wrangling 50-plus-one Senate votes on a major bill can be quite challenging, and one conservative member is already signaling he's a "no" on the plan currently being discussed. If Senate Republicans are able to get their acts together and pass something, a conference committee would hammer out the differences (some of which are substantial) between each chamber's bill, crafting a compromise law that would bounce back to each house for final passage. There are a number of objections being raised to the Senate bill, including the populist talking point that it would make corporate tax cuts (which Democrats once supported) permanent, whereas the cuts for individuals and families would expire midway through the next decade. The reason for this discrepancy has everything to do with budget rules, under which the legislation can only add a certain amount of money ($1.5 trillion over ten years) to on-paper deficits. Past experience strongly suggests that Congress does not have the will to allow tax increases on middle class families to occur, and Republicans would push hard for a renewal of the lower rates. The only way those tax increases would occur is if a hypothetical Democratic Congress refused to prevent it. Republicans should pressure their opponents at every opportunity: If you're complaining about the expiration provision, will you commit to ensuring that the lower rates never expire? It's also interesting to listen to Democrats falsely suggest that the GOP bill would not cut middle class taxes, then also turn around and warn that if the GOP bill's new rates expire, middle class Americans will face a tax increase. 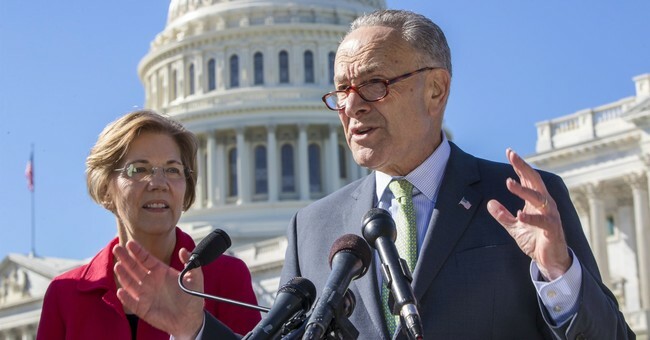 The latter attack proves that the former attack is bogus -- and the latter criticism vanishes if Democrats would simply vow to extend or make permanent the lower rates when a potential deadline arrives. This is exactly what they did with nearly every single bit of the Bush tax cuts, as part of the Obama-era "fiscal cliff" deal. [Another] category of Democratic complaints revolves around the Congressional Budget Office’s estimate that 13 million fewer people would have health insurance in 2026 if Republicans repealed Obamacare’s individual mandate. “We’re kicking 13 million people off health insurance to give tax cuts to the wealthy,” exclaimed Senate Minority Leader Chuck Schumer (D., N.Y.) on Wednesday. There are two problems with Schumer’s assertion. As Glenn Kessler, fact-checker at the Washington Post, notes, nobody is being “kicked off” their insurance. People are no longer being fined for not purchasing it. (Kessler gives Schumer two Pinocchios.) The second problem is that the CBO’s projections of the mandate’s magical powers are inaccurate, by their own admission. Did you hear the one about the “private jet deduction” in Senate Republicans’ tax bill? There’s less to it than that—and it’s backed by one of the most liberal Democrats in the Senate. The provision attempts to ensure an excise tax for commercial airline flights isn’t imposed on private flights operated through management companies. Under the law, private jet owners pay a higher fuel tax than commercial airlines do but no ticket tax, said Troy Rolf, an aviation tax attorney at GKG Law. After years of court cases and Internal Revenue Service audits, some of the definitions had gotten vague or confusing...The main Senate bill on this issue was sponsored by Sen. Sherrod Brown (D., Ohio)...“This provision in no way cuts taxes for private jet owners,” said Jennifer Donohue, a spokeswoman for Mr. Brown. “It simply clarifies what the law already says—that service companies made up of mechanics and service workers don’t pay ticket taxes, because they don’t sell tickets.” Mr. Brown’s home-state colleague, Republican Rob Portman, wrote the amendment that got the provision into the Senate bill. “This bipartisan proposal clarifies the intent of the law and stops a specific IRS abuse when the agency chose to ignore the law,” said Kevin Smith, a spokesman for Mr. Portman.